Wildfire and Rangeland Management – Mediating Impacts to Conservation and Ranching. The 2016 Rangeland Summit addressed challenges and opportunities to improve rangeland management aimed at reducing the incidence (scope and severity) of catastrophic wildfire. Two of the state’s most devastating wildfires occurred in the past year and yet the full impact of these fires to conservation interest and rancher sustainability is yet to be determined. The prospect of a normal rainfall year raised additional wildfire concern. 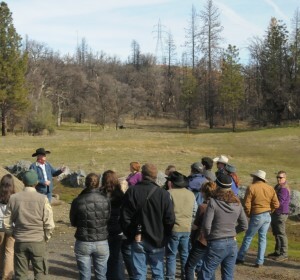 Co-sponsored by California Rangeland Conservation Coalition (CRCC) and University of California Cooperative Extension (UCCE), the January event brought together more than 300 individuals from various walks of life to learn more about the topic that they could apply on their own private or public rangelands and in their communities. Speakers from UCCE, the California Cattlemen’s Association, Cal Fire, UC Berkeley, local ranchers, and high school Range Campers, Mary Marsh and Jane Wood shared their personal experiences and knowledge about rangeland management and wildfire. Each talk was individually videotaped and published on the UCCE website to expand the Summit’s reach. Ranchers, Doug Joses and Shaun Crook shared compelling insights from recent fires. CCA Vice President, Government Relations Justin Oldfield’s presentation, A Beef Industry Perspective: Economic, Social & Range Management Impacts Caused by Wildfire especially enlightened the non-ranchers. Other presentations covered fire behavior and science, and fuels management, and impacts of catastrophic fire on California’s rangelands, and the state of current science for post-fire grazing management. 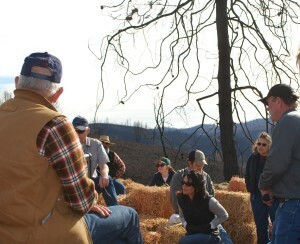 Many participants toured fire sites where local experiences and lessons were shared and discussed – Butte Fire (Amador/Calaveras County), Rim Fie (Tuolumne County) and Tesla Fire (Alameda). Share the Summit presentations link with others in your community or organizations as a catalyst for communication and planning to mediate the impacts of wildfire in your community. Who attended the Summit? Everyone had wildland fire and rangeland management concerns in common, and they wanted information to use as they plan forward to the 2016 fire season and beyond. Participation was very diverse by profession (29% ranchers, 13% public land managers, 22% ‘other’, 19% organizations, and 18 academic/student). Sixty-five percent of them had personal experience with rangeland wildfire, and half of those had it within five years. The Summit provided useful information that facilitated consensus among these diverse stakeholders on several items. Livestock grazing is valuable as a management tool on pre-fire management to reduce wildfire severity. Research is needed about connecting wildfire and rangelands, post-fire grazing, the values of different livestock species, and about cattle behavior. Importantly also, the available research should be utilized. Participants told us how they plan to utilize what they heard. Broader than the wildfire topic, non-ranchers increased their understanding about ranching. They better understand regulatory barriers in management decision-making, and the relationship of private land to public allotments, and ranching economics and viability. Non-ranchers shared these comments. “We need economic and market solutions for ranching sustainability. It’s not profitable.” “I learned the importance of public land allotments for ranching vitality.” “I need to consider long term licenses on my agency’s land” to have animals familiar with the land and consistent grazing. More broadly, “I learned to consider things from multiple perspectives.” That, after all is the purpose of the California Rangeland Conservation Coalition.